Ahhh, I find out about stuff sometimes and I'm like, "HOW DID I NOT KNOW ABOUT THIS?!" Especially in light of the fact that I have a small child and my husband and I both love heavy metal. I'm probably really tardy to the party here, but I have to tell you about Hevisaurus! Hevisaurus is a children's heavy metal band from Finland. THEY'RE DRESSED LIKE GIANT DINOSAURS I CAN'T EVEN HANDLE HOW AWESOME THIS IS! So the story is that a drummer (Mirka Rantanen) from another popular metal band in Finland (Thunderstone) went to a children's concert with his kids and decided that there should be a metal band specifically for kids. 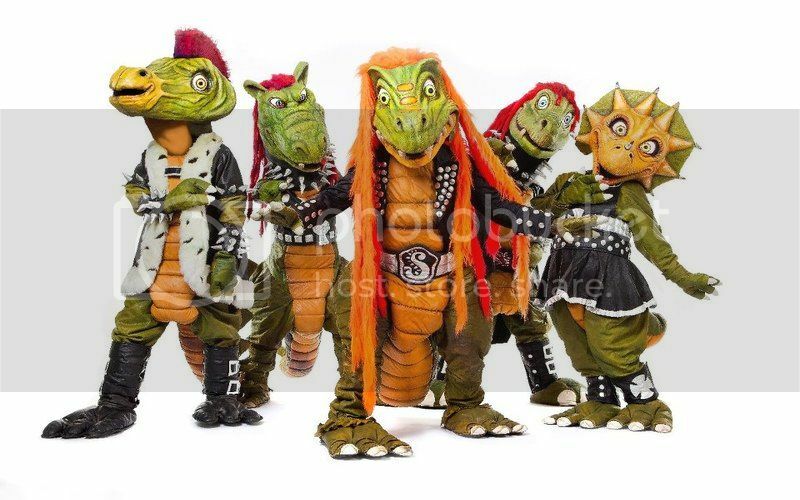 He took a bunch of his metal friends and they wrote all of these songs together, and they began performing in giant dinosaur suits. They're pretty popular over in Finland, even though they don't appear to have ever made it over to the US. There was some dispute with the record company in 2011 over the rights to the name, so a bunch of the original guys ended up leaving and forming their own other children's metal group, called SauruXet, but research tells me that this group split up in 2012. It seems like the disbanding of SauruXet might have been part of the legal settlement with Sony over Hevisaurus rights. Apparently Hevisaurus is still going strong (even with new/replacement members), as evidenced by their website (as far as I can tell when I translate it through Google). Hey they even have a MySpace page (wait, what - that still exists?!!!). Still no signs of coming to the US though. Maybe I have to plan a trip to Finland for our family soon. Have you heard of these guys? Are you as amazed as I am?